Sensory bottles are most often used for calming an anxious child, or for no mess safe sensory play. 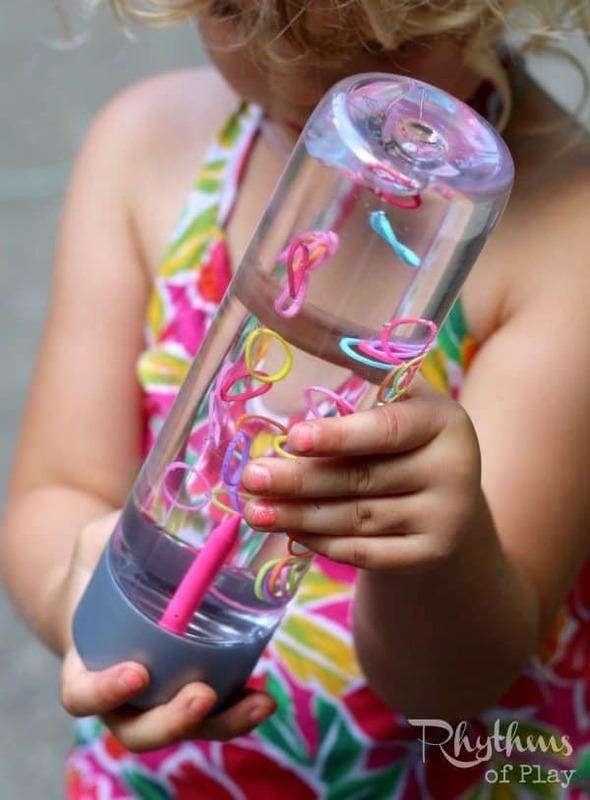 This sensory bottle is a fun ringer game that can help your child focus, calm down, and learn to self-regulate. 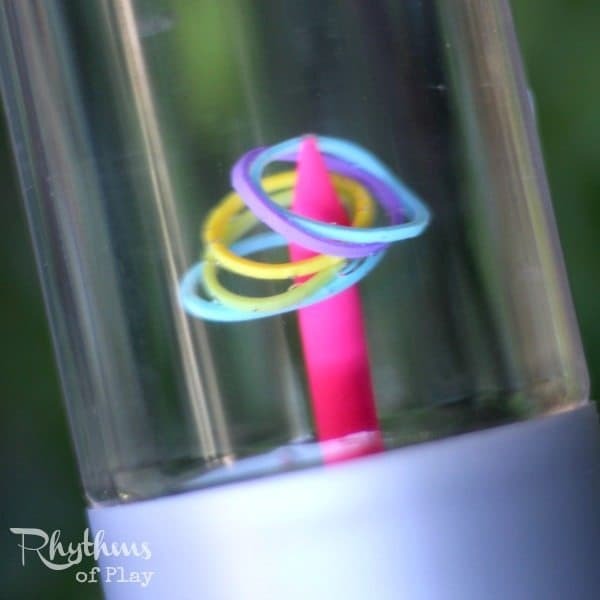 You may also like this Glow in the Dark Ringer Game Sensory Bottle. My daughter and I are always stealing this bottle from each other to play with. We both love it so much I will be making a glow in the dark one next. Sign up for my newsletter below so you don’t miss it! 2. Empty and/or drink water in bottle. 3. Glue the golf tee to the lid. The following directions are important if you want the golf tee to stay stuck to the lid. We tried to use a glue gun for our first go round and it failed in less than 12 hours. Start by peeling the backing off of the bottle lid. Next, use a nail or other sharp object to score the top of the golf tee. This will help the glue bond with the slick plastic surface. 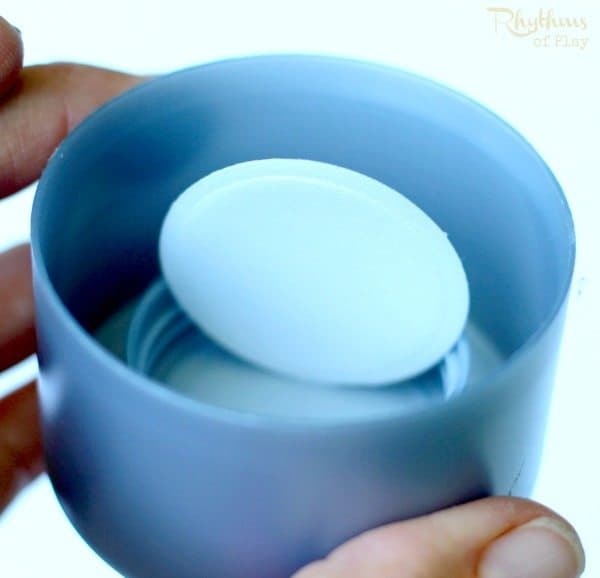 Fill the top (martini glass) of the golf tee with E6000 glue and attach it to the inside of the lid. Use it outside away from children and allow it to dry outside, the fumes are toxic. Carefully place a small amount of glue around the perimeter of the golf tee to give it extra strength and bonding power. Not too much or you won’t be able to put the lid on the bottle. Allow to dry for AT LEAST 72 hours before completing the steps below. This glue takes several days to cure and bond. 4. Fill the bottle about half way with water. 5. 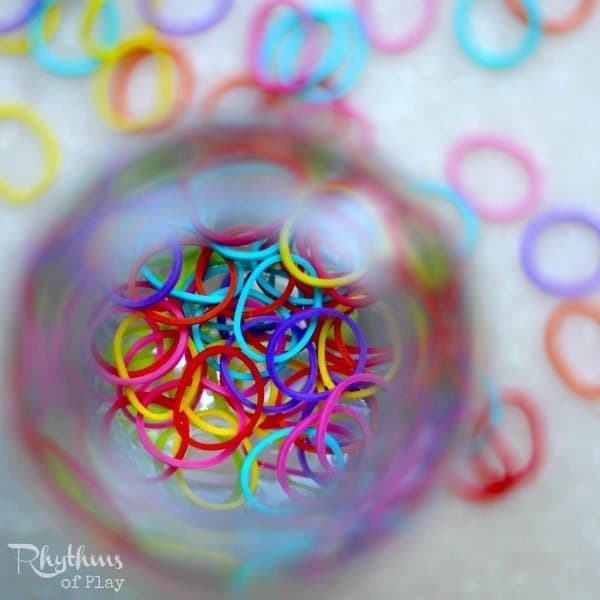 Drop about 20 – 30 loom bands into the bottle. We used too many at first and ended up taking some out. Less makes the game more fun. My daughter also insisted that we leave out the black and white ones. 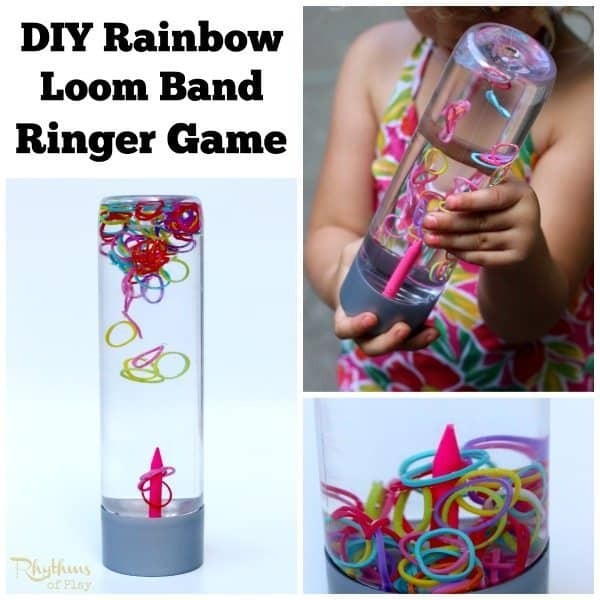 Use the solid colored rainbow loom bands. The jelly loom bands tend to float instead of sink. 7. Place the lid on the bottle and enjoy trying to get a ringer! Loom bands are wacky because sometimes they float. My daughter moves the bottle around so much when she plays it doesn’t seem to matter. She still gets ringers and is overjoyed every single time! 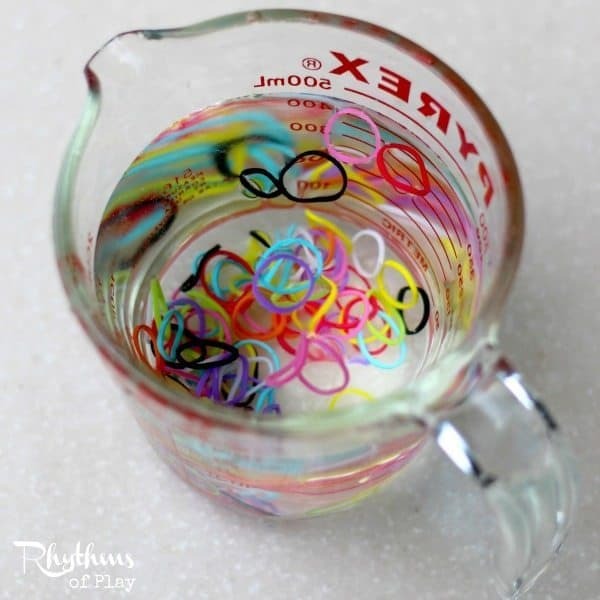 Play with your loom band ringer game sensory bottle for a few days before you glue the lid on. That way you can add more loom bands or take some out. You can even take the bands that end up floating out of the bottle after a day or so if you like. Or, you can test them beforehand in water as a type of science experiment like we did. 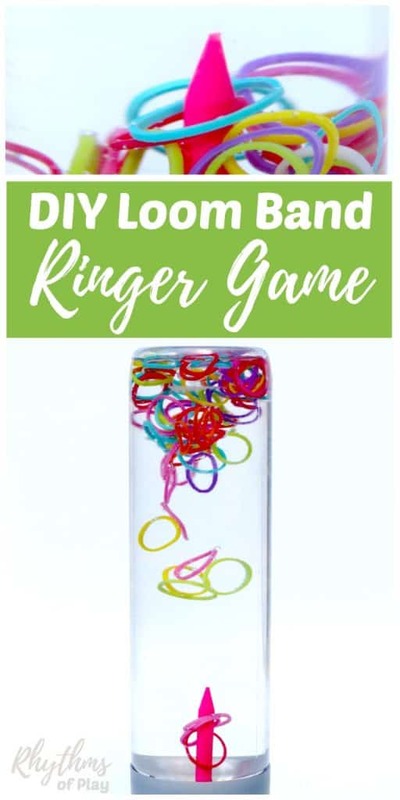 A DIY rainbow loom band ringer game sensory bottle is a super fun way to help children (and adults) calm down while they play. Bottles like this are also the perfect way for babies and toddlers to play games with small items without the risk of choking on them. I will be making one of these ringer game sensory bottles using glow in the dark loom bands next week. Sign up for my newsletter below so you don’t miss it! Hmmm… really? I’ve never run into that problem. If you live outside of the US that may be the reason. I don’t know if there is any way to get that off, but you can use any bottle out of the recycle bin that you can remove the label. Canning jars work too, but they are glass so there is that. I’m making my first sensory bottle and it’s not going well! I added glitter to the rainbow loom bands and the glitter seems to all be sticking to the bands instead of moving around the jar. And all the bands are clumping together. Any advice? I’m so sorry that you are having trouble, Sarah. While it sounds fun to add glitter to a loom band bottle, unfortunately, you have discovered that it will not work. Loom bands, glitter, and glue do not mix!! I would recommend making either a loom band sensory bottle, or a glitter sensory bottle, but not combining them into one bottle. If you are looking for a few fun glitter sensory bottles, try our galaxy, mermaid tail, or Frozen-Inspired Snowstorm sensory bottles! You can find them using the search bar at the top of the page. I hope that helps! I have made this a few times too, and find the rings stick together, and also they fall too fast. The kids get frustrated 🙁 Have you tried any additives to slow them down or keep the rings from sticking together? Hi Belinda! Try dumping out a bit of water and adding liquid hand soap. It may turn murky after the first shake, but it will clear and settle if you fill the bottle all the way to the top before putting the lid on.